Gozo Fun believes elements of surfing have the potential to ground human beings in a uniquely meaningful way. 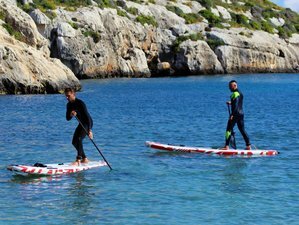 Stand up paddle board is the most exciting, unusual, eco-friendly way to explore the beauty of Gozo and Comino Islands. Stand up paddle boarders stand on their boards and use a paddle to propel themselves through the water. Hoe he'e nalu in the Hawaiian language are offshoots of surfing that originated in Hawaii. Your accommodation during this holiday will be in a tent. Sleeping bags are included. Your SUP adventure starts at 3:00 p.m. in Hondoq Bay, Qala. From the bay, you will paddle across the Gozo Channel to the beautiful Santa Marija Bay in Comino. On arrival, you will pitch your tents at a camp site and then head back out onto the water to explore the gullies and caves around the island. Adrenaline junkies will also have the opportunity to do some rock jumping for those who dare! Alternatively, you can fill your evening with lots of activities (as snorkeling, hiking, yoga etc.) or just chill out on the amazing beaches of white sand and swim in the crystal clear water. No visit to Comino is complete without a visit to the world famous Blue Lagoon to watch a beautiful Mediterranean sunset. This is a ‘must see’ when in Malta! You will end the day with a barbecue at the Santa Marija Bay and sitting around a bonfire chatting and playing some music. The next morning we start with a tasty breakfast, break camp, and then head back over to Gozo approximately at 11:00 a.m.
Malta, Gozo, and Comino are an archipelago of coralline limestone located in the central Mediterranean, some 80 kilometers (50 miles) south of the Italian island of Sicily. With 56 kilometers of coastline, Gozo offers a Mediterranean climate with mild, rainy winters and hot, dry summers. Although the total population is of only 30,000, the island gets over one hundred thousand tourists, every year. They come attracted by the beautiful beaches, water, fauna, and flora. You will have fresh fruits and water during this holiday. At the end of the day, you will also enjoy a barbecue while sitting by the bonfire in Santa Marija Bay. Gozo Fun originates from an idea of group of friends who lead a life linked to the sea and all her beauty.